Rest in peace to "Steve" the sinkhole. He was roughly 35 hours old. 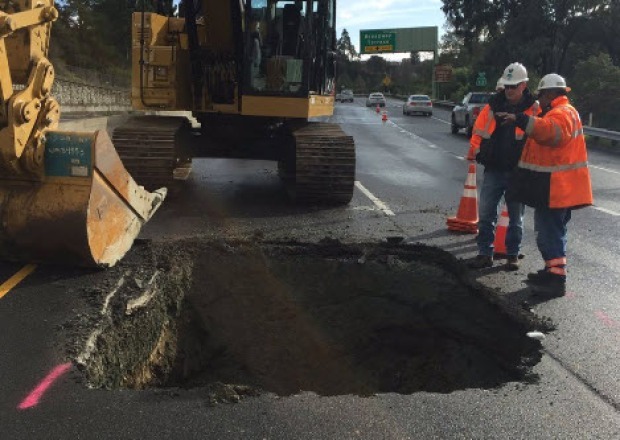 At about 4:30 p.m. Tuesday, the California Highway Patrol announced the massive hole in Highway 13 at Broadway Terrace in Oakland was fully filled in with concrete, and drivers could now ride freely on the newly named "Andy Asphalt." The sinkhole was reported on Monday at 5:20 a.m. after a weekend of pounding rainstorms. 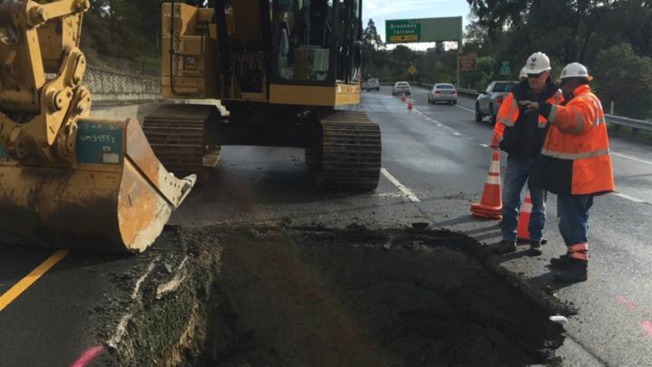 And Caltrans worked for more than a day to repair it by filling it in with concrete. While East Bay drivers sure didn't enjoy single-tracking it along Highway 13, many on Twitter got some laughs over the naming of Steve, possibly the first sinkhole in the United States to be named. For example, Kristin Rasmussen tweeted: "The fact that the CHP named this sinkhole makes my day/week/year." Officer Sean Wilkenfeld, the Oakland division's spokesman, acknowledged to NBC Bay Area that he is indeed the mastermind of and "stepfather" of Steve's creation. "We constantly are putting out public safety messages," he said. "And I get it, sometimes they get lost in the jumble. Sometimes you gotta' think outside the box." @ljfernandez@nbcbayarea We're not aware of any other times. Maybe Steve is the first!